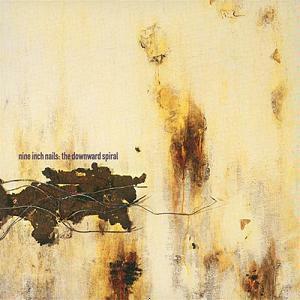 The Downward Spiral is the second studio album by American industrial rock act Nine Inch Nails, released March 8, 1994, on Interscope Records. It is a concept album detailing the destruction of a man, from the beginning of his "downward spiral" to his climactic attempt at suicide. The Downward Spiral features elements of industrial rock, techno, and heavy metal music, in contrast to the dance-influenced Pretty Hate Machine (1989). Co-produced by Trent Reznor and Flood, the album's concept was written after the Pretty Hate Machine Tour Series concluded in 1991. Reznor and Flood moved to 10050 Cielo Drive in Beverly Hills, California the following year, where The Downward Spiral was recorded. It was influenced by various records like David Bowie's Low (1977) and Pink Floyd's The Wall (1979). Production wrapped up in February 1994 when it was mastered by Alan Moulder. Entering the Billboard 200 at number two, the album has sold over five million copies worldwide, while it was certified quadruple platinum by the Recording Industry Association of America (RIAA) for shipments of four million copies in the United States (making it the act's highest selling release there). The Downward Spiral was a major commercial success that established Nine Inch Nails as a reputable force in the 1990s music scene, since "Hurt" and "Closer" cracked the Top 10, the latter with a provocative music video. It has been widely regarded by music critics as the band's best work. A companion remix album, Further Down the Spiral, was released in 1995.